Like all the other river bridges in town, the 6th Street Viaduct has a tower for the bridge tender. 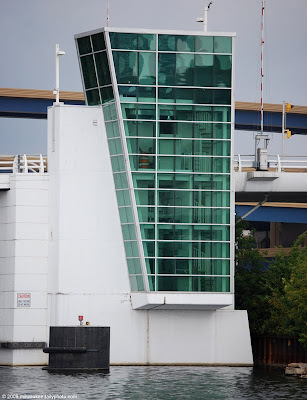 As the newest bridge, the tower fits in with the rest of its architecture; the glass and steel create a wedge surrounding the spiral staircase inside. looks like something in an amusement park! lovely! modern and functional!